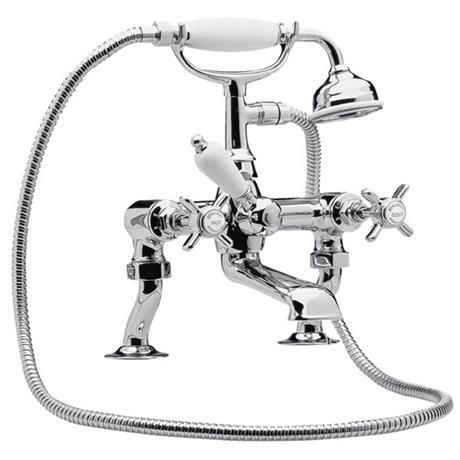 The Luxury Beaumont 3/4 Inch Cranked Bath Shower Mixer. This perennial favourite collection of basin taps and bath shower mixers capture the aura of a bygone time. The Beaumont tap and mixer collection is the perfect partner to the Beaumont showers range. Q. the distance between centres on my bath is 180. Will these taps fit ok.
Hi Ranny, unfortunately the distance between these taps is 190 mm. Sorry I couldn't help more today, please let me know if there is anything else I can do for you. Hi Jane, thanks for your question. No these traditional Beaumont taps are 'screw down' internals. Q. Please could you tell me the manufacturer of these taps? I need to contact them for spare parts. Hi Em. These Taps are made by Ultra. Have seen many traditional shower mixer taps in the last three weeks. This one is of good quality and looks beautiful on. I purchased with rigid riser rail and together, it looks impressive. On a customer service note, I found Victorian Plumbing helpful, as was the manufacturer, 'Ultra'....thumbs up from me and I'm very picky!!! We ordered the tap to replace an old one and it looks really good. All working well so far. The cranked arms are useful when fitting to non-regualr width tap holes and the appearance and build quality seems good. Shower hand-set white handle looks a little cheap but I think this will wear a bit with age and be less of an issue. I had been looking for a while for a Mixer tap that would fit the Victorian Bath I have - the distance between the tap centers being a non standard 8.5", the great thing about this item is that the feed to the mixer allows you to adjust to the distance of the bath holes. Highly recommended product looks great and very good quality. Trying to find replacement taps for my original iron bath proved to be really difficult. Victorian Plumbing was the only place I could find that had the taps wide enough apart and with the appearance I wanted. Yes I had to move away from brass, but it's actually lifted the whole room and I'm now going to replace all brass fittings with the same make/model in chrome. Excellent service too. I am very pleased with the taps i have bought they look fantastic and finish of my bathroom great. the staff were very helpfull in helping me choose the right item for me!